Read our book and ride with us! 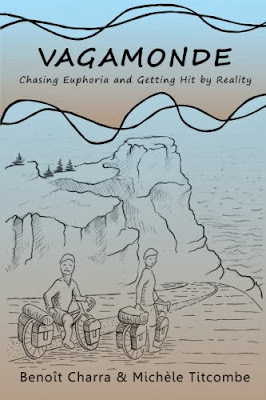 Our book Vagamonde: Chasing Euphoria and Getting Hit by Reality is now available in English for purchase on Amazon.ca, Amazon.com, Amazon.co.uk, Amazon.fr, Amazon.de, Amazon.it, and Amazon.es. In May 2010, we left Montreal, Canada to pedal our way to what would end up being a two-year journey through sixteen countries. Most bicycle travellers leave for a year or two, renting out their house and putting their belongings in storage. We left our jobs, sold our stuff and gave up our apartment. 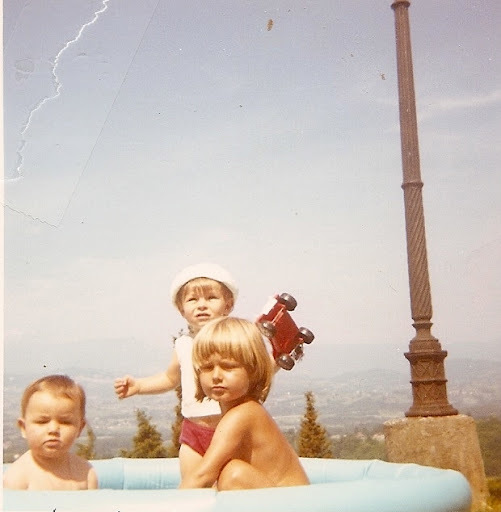 Except for some sentimental objects kept by family, all that we owned was with us on our bicycles. This blog post is from the beginning of our trip, that is, two years ago in June/July 2010. It's time to leave Iceland and get our asses on the ferry. Once on board, we park our bikes next to all the German bikers and start looking for our cabins. The cheapest option was to share four bed cabins: since they are not co-ed, we have to stay in separate rooms. The men in my cabin are uninteresting and have nothing to say. Michèle, on the other hand, has a loud mouth ex-biker chick staying with her. With her raspy voice that cries out "Too many cigarettes! ", the biker chick tells us that she, and her new Dutch husband, are going back to the "land of green". - Land of green? I ask her. - Because it's legal there she tells me. 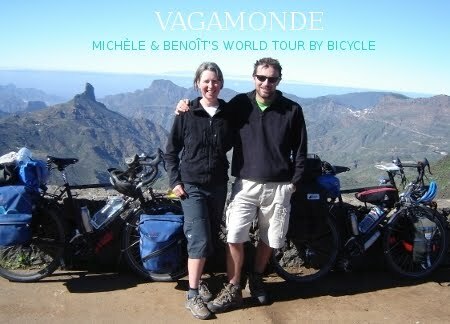 Michèle writes: I met one of my cabin mates for the ferry ride, just as Benoit was walking away to find his cabin. She laughed with a husky loves-the-cigarettes rumble. - I see your husband is cheap too, she said. Well, we thought we had cheaped out as much as possible, but we were wrong. There were even cheaper rooms to be had, but not from where we reserved our tickets online. Down in the belly of the ship, under the car decks, were 6-person dorm rooms. We see Sebastian on board, the Masters student we encountered several weeks back. He had one of those rooms all to himself. He heard his neighbour across the hall retching all night. I guess sometimes there's a price to pay for the cheap rooms. After the perpetual light of Iceland, we head to bed for the ultimate sensory deprivation. Having no windows, the cabins are pitch dark and extremely stuffy. I wake up feeling as if I slept under water: drenched in sweat and unable to breathe. Glad that it's morning we get a breath of fresh sea air before heading to the breakfast buffet where Roland is getting in scavenge mode. We eat breakfast the proper way and watch him stuff his pockets with anything he can get his hands on. He tells us that we should do the same. It's probably a good idea because most of the food will be going in the garbage. However, we are feeling much too old for this sort of behaviour. We'll be content with busting a gut watching him walk out looking like the Michelin man. The North Sea was the exact opposite for us: it couldn't have been calmer. Without even nausea to while away the hours, we had to find some way to battle the boredom. One, as Benoit mentioned, was watching Roland pocket stuffing at the breakfast buffet. Another, was to get him to say the word 'buffet' for no other reason than it was really cute the way he said it. - Tomorrow morning, will we see you again at the breakfast ... uh ...?, I'd ask, hoping he'd fill in the blank when I paused. Yep, we were bored. With nothing to do for three days, we head down to the last deck to check out the facilities. There's a pool and a sauna and since children hours are over, we decide to go for a swim. The pool is somewhat entertaining as there is a perpetual tsunami going back and forth due to the rocking of the boat. After the pool we head to the sauna. As we go in we bump into Sebastian again. He is holding something in his hand. - What's that? I ask him. - Sauna Øl he tells me (Sauna Beer). Apparently in Sweden, it's a tradition to have one beer in the sauna. Sebastian informs us that there is a duty free liquor store on board. - Is the beer cold? I ask him. - No, it's piss warm he tells me. Michèle writes: Dirt cheap lukewarm tinnies at the duty free shop or costly chilled beers at the bar ... guess where we went. Many passengers had the same idea. One pair of youths, barely out of their teenage acne years, were facing each other across a circular table that was completely covered with beer tins. The lankier of the two lurched to his feet to replenish their table stock at the shop. Oops, better get there quick: a clerk was just closing the door to lock up. The skinny kid slipped in, grabbed a flat of 24, paid for it, and was back out the door before the guy even blinked. We saw those kids on deck the next day, looking like they were moments away from puking on each other. Three days and two nights on the ferry and it's with joy that we disembark. Today, we are excited because this is where we meet up with David whom we met in 2007 on our trip to Cuba: we'll be traveling with him for three weeks, all the way to Copenhagen. We meet him the next day at a campground nearby. The campgrounds here are not the simple patch of grass that you get in Iceland. They are family oriented and expensive: swimming pool, water slides and all the facilities imaginable, even a petting zoo. This is tarnishing our image of adventure cycling and draining our budget. Like the biker chick said, I am becoming cheap. For me, the budget is a mind poison: leaving it all behind (including my job) has created a dark cloud over my head. The result is a lingering stress that I can't seem to shake. Worried about being in Europe where life is expensive, I find myself eager to get to cheaper countries. Well, that won't be for a while since we have to go to France to pick up our new bikes. Michèle writes: We rode down the ramp and off the ship into the bright sunlight and warmth of Denmark in the summer. Finally no need to wear my fleece jacket. I still had my sea legs after 36 hours of being on that ferry. 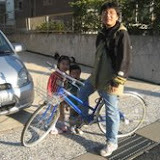 I felt fine while on my bicycle, but swayed slightly when walking as I adjusted to being back on solid ground. Since there was no David to greet us, we chose the closest campground to the ferry terminal to make meeting up the next day all the more easy. Unfortunately you had to pay for all the campground services that you didn't want. Benoit forgot to mention the rows of huge freezers. I don't get the appeal of the holiday campground. It looks like just moving from your regular house to a plastic house. This type of camping is not exclusive to Denmark. We're more familiar with the ones in Canada and know to avoid them. So our first camping experience in Denmark came as a shock after the wilds of Newfoundland and the pre-tourist season emptiness of Iceland. - What do you guys want to do? - Let's go for a bike ride! says David. David has way too much energy. In the morning we get woken up by a herd of sheep trampling through the campground. Luckily our tent was off to the side and we avoided the stampede. The adventure continues through the campgrounds of Denmark, each one having something unique. One morning we wake up to find our panniers infested with earwigs. At the toilet of another campground, someone didn't seem to aim right whilst defecating and ended up shitting on the floor. How can something like that happen? Alcohol was probably involved. Another place had a shoe eating fox roaming around but, to our disappointment, we didn't see him. What will we find next? Michèle writes: David read somewhere that the churches in Denmark always have a toilet and drinking water for public use. I needed to pee but with no church in sight we opted for a restaurant. It looked a little too fancy pants for us, so we weren't planning to stay for a meal. I raced for the washroom and David acted as a diversion by asking the staff about these mysterious Natur campings, one of which was supposed to be in the area. David was a master at asking directions. He'd stride up to anybody, with a big grin and a hearty "Hello!" no matter what the other person's language. I came out from using the washroom to find him in full flirt mode with one of the waitresses. Unfortunately I also noticed an earwig crawling up the tube of his water backpack. Just before it crawled onto his neck, I slapped it onto the ground, which killed the mood. Sorry, David. But the good news was that the waitress knew how to find the Natur camping. We were on our way. Denmark has the most amazing bakeries. Huge displays with shelf upon shelf of the most scrumptious looking breads, cakes and pastries. One day David and I were standing in a bakery trying to choose what treats we would buy. Benoit stood guard outside with the bicycles.There was a pretty blond woman behind the counter, waiting patiently for our selection. David flashed his pearly whites. He motioned to the many shelves of breads and cakes. - Do you sell all these in one day? he asked incredulously. David paused as he looked around, I think trying to find the bags of "day olds" for sale. - Where does the stuff go that you don't sell? - In the garbage, was her reply. - Oh, and where is your garbage? No matter that we had a super detailed map of the myriad of bicycle paths in Denmark, we still got lost. Many times. Once we took a wrong turn and found ourselves in a Bible camp. They were friendly there and they had ice cream but we didn't stay. Another day we were searching for one of the elusive Natur camping spots and ended up in the town of Gludsted. It was a quiet place, with nothing open and no-one on the streets. I half expected a tumbleweed to go rolling by. The three of us were stopped in the middle of the road discussing our options. No food, nowhere to camp, what to do? A man came out of his house. He was motioning us inside. - Do you know...? I began. - I know everything he replied. Come, come. Benoit and I didn't hesitate and followed him inside. We had learned in Newfoundland that we'd regret saying no to invitations. David soon followed. Hans, he who knows everything, introduced us to his wife Birgitta and their dog Zilla. Really, we have Zilla to thank. It was her barking in that quiet little town that alerted them of our presence. Suddenly our situation was on the flip side: they invited us for food, tons of it, and drinks to match, and a place to camp on their lawn. Thanks, Hans and Birgitta, for an unforgettable Denmark experience. For our final approach to Copenhagen, I call a contact obtained by my mother. Emilie is a family friend who, apparently I used to play with in a pool when I was two years old. - She is waiting for you to call my mother tells me. Turns out she had no clue that we were in Denmark or even who I was. But no matter, after explaining what should have already been explained, we get invited to spend a few nights. It's all great fun because Roy, her husband, sees it as a great opportunity to break out a flat of beer and a pack of social cigarettes. Aside from mosquitoes we all had a great time. If you are young, you cannot go to Copenhagen without checking out Christania. For us, who are pretending to be young, it seemed like a worthy tourist attraction. I had never heard of Christania before David described it as a bunch of hippies who built houses on an old army base. At once I imagined groovy artists creating all sorts of weird and interesting stuff: if that was the case, we didn't see it. We did see, however, a large open air drug market: kiosks with multicoloured hash tablets on the counters and people in deep conversation about the quality of the merchandise; you would think they were talking about fine wine. Having no patience for this sort of subculture I get into one of my unfortunate bad moods. - How do you know that hippies have been to your house? - In Danish, vagabonde means tramp. He looked quite serious so I resisted laughing. I asked, Do you mean like a type of homeless person whose only belongings are tied in a bundle on the end of a stick? He nodded. I thought of me and Benoit with not much left of our possessions except our bikes and panniers. Yep, I thought, that pretty much sums us up. When we got to Copenhagen, I looked up some more of my relatives whom I had never met. We were invited to afternoon tea. Emilie helped us to find on the map where they lived. - It's a nice area, she said. Very nice. I had a tinge of a worry in the back of my mind: maybe they'll think we're bums and won't want to let us in the house. Nothing could have been further from the truth. When we arrived to meet Keith and his family, they welcomed us graciously like we were old friends. The afternoon tea stretched to dinner and to overnight. The next morning Keith accompanied us on his bicycle to make sure we didn't get lost going downtown. So much for my worries. With our limited time in Europe, we decide to fly to France. Since we have new bicycles waiting for us there, we decide to donate our old ones to Baisikeli, an organization that ships used bikes to less fortunate people. Once all packed up, we get a ride to the metro in a cargo bike. All of our Denmark photos are here.